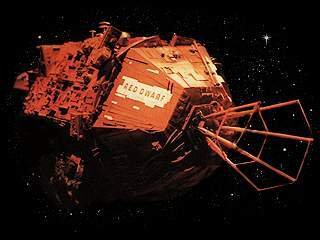 This is an SOS distress call from the mining ship Red Dwarf. The crew are dead, killed by an radiation leak. The only survivors were Dave Lister - who was in suspended animation during the disaster, and his pregnant cat, who was safely sealed in the hold. Revived 3 million years later, Lister’s only companions are a lifeform who evolved from his cat, and Arnold Rimmer, a hologram simulation of one of the dead crew.